Accepted Scientific Name: Austrocylindropuntia shaferi (Britton & Rose) Backeb. Fruiting habit. 3710 metres above sea level, Near Tafna, province of Jujuy, Argentina. Origin and Habitat: Austrocylindropuntia shaferi is distributed in Argentina in Jujuy, and in Bolivia in Chuquisaca, Oruro, Potosí and Tarija. The species is very abundant throughout its range. Altitude range: 1,500 to 3,800 metres above sea level. Habitat and Ecology: Austrocylindropuntia shaferi grows in very rocky soils with very little vegetation, in prepuna and puna. It also grows on dry hills and near river shores. There is no known use or trade of this species. There are no major threats for this species. Austrocylindropuntia shaferi (Britton & Rose) Backeb. Description: Austrocylindropuntia shaferi is a moderately branched, cactus species forming erect clumps, to 30 cm or more tall and 15 cm in diameter. Derivation of specific name: This member of the Cactaceae family was given this name by John Adolf Shafer (1863–1918). USAmerican botanist, pharmacist and plant collector who collected cacti for the botanists N. L. Britton and J. N. Rose in South America in 1916–1917. Shafer's Opuntia. Stems: Usually in clusters of 2 to 20, branching near soil level, erect, sometimes divided into distinct segments. Segments cylindrical to subclavate, to 15 cm long and 2.5 to 3.5 cm in diameter, dark green, very spiny. Tubercles low, often indistinct, irregular. Leaves: Deciduous, conical, 6 mm long, dark green. Areoles: 1 cm apart or less, small, circular, white-felted. Glochids: Numerous, prominent, whitish from the upper margin of the areole. Spines: 6-15 at an areole, brownish, reddish brown or whitish, needle-like, unequal, not stout, flexible, spreading, varying from 1 to 5 cm long and sometimes associated with long white hairs or bristles. Hairs few to several (5-20), 0.5-2 cm long, white, caducous. globose, 8 mm in diameter; style cylindric, slightly protruding over the stamens, cream-coloured, stigma lobes 4-5 green, papillose. Fruit: Globular, about 2 cm in diameter, bright red, half-dry, bearing numerous large areoles, the areoles white-felted, with glochids and hairs, but no spines, caducous when ripe. umbiculus flat, pale-brown. Pulp, white. Seeds: 10-30 per fruit, 2 mm long, 1.3 mm in diameter, turgid, pyriform, pointed at base, with apical hilum smooth, yellow-brown, with a prominent slightly paler dorsal line. The fruits do not split open at maturity, but they break up as they rot on the ground. Similar species: Austrocylindropuntia shaferi is closely related to Austrocylindropuntia vestita but less cespitose, taller and larger, and with fertile fruit. Moreover the stems of A. vestita are completely covered with hairs with spines less than 15 mm long, while the stems of A. shaferi have some hairs only on the juvenile growth and spines 10-50 mm long. 3) Edward F. Anderson “The Cactus Family” Timber Press, 2001Hunt, D., Taylor, N. and Charles, G. (compilers and editors). 2006. The New Cactus Lexicon. dh Books, Milborne Port, UK. 4) Lowry, M., Ortega-Baes, P. & Perea, M. 2013. Austrocylindropuntia shaferi. The IUCN Red List of Threatened Species 2013: e.T152086A595592. Downloaded on 27 February 2016. 5) Kiesling, R. and Ferrari, O.E. “100 Cactus Argentinos”. Albatros, Buenos Aires. 2009. 6) Santecchia, S. and Rajal, M.V. ”Descripción de las cactáceas del extremo norte de la Puna Jujeña - Argentina.” Boletín de la Sociedad Latinoamericana y del Caribe de Cactáceas y otras Suculentas 6(1): 14-17.2009. 8) López, R. P. “La prepuna boliviana.” Ecol. Bolivia 34: 45–70. 2000. 11) Curt Backeberg “Blätter für Kakteenforschung: Bulletin of actus research” 1935(pt. 8, sine pag. ):  genus 10, subgen. IV-1-b, sp. 2 (fig.). Type (not preserved): S. Bolivia, 3000 m., collector not stated. 13) Austrocylindropuntia shaferi (Britton & Rose) Backeb. in Cact. Succ. J. Amer. 23:14 (1951). 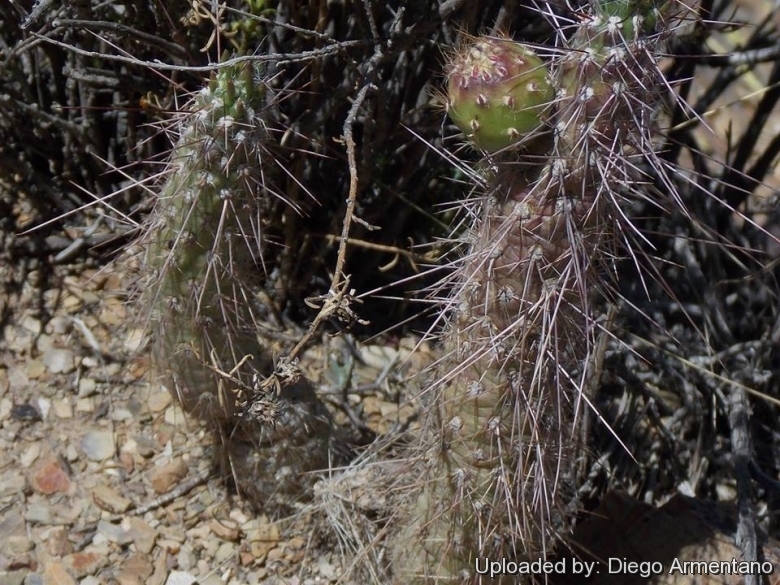 14) Cylindropuntia shaferi (B. & R.) Backeb., in Backeb. & F. M. Knuth, "Kaktus-ABC", 119 (1935). 16) Austrocylindropuntia weingartiana (Backeb.) Backeb., in Cact. Succ. J. Amer. 23:14 17) (1951). Cultivation and Propagation: This particular species needs regular watering when soil is dry during the growing season is but it is prone to root rot, so prudent watering is necessary. Keep dry in winter. I comes from high altitude and do not like hot, stuffy summers, it is best to put them in airy places with ample airflow. It requires a very drained and mineral potting mix and a full sun or slightly shady exposure. Protect from severe frost. Propagation: Seeds are seldom available and extremely difficult to germinate. Best reproduced by cutting that produce roots easily.